What is the Shopware ID? How can I pay or recharge my account? How can I automatically pay for my orders? Where can I find the bills / documents? 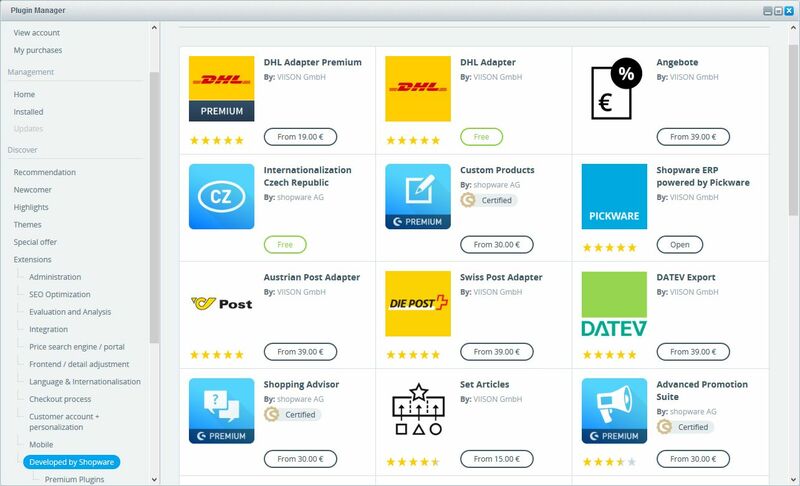 The account is your pivotal point for all services around Shopware. 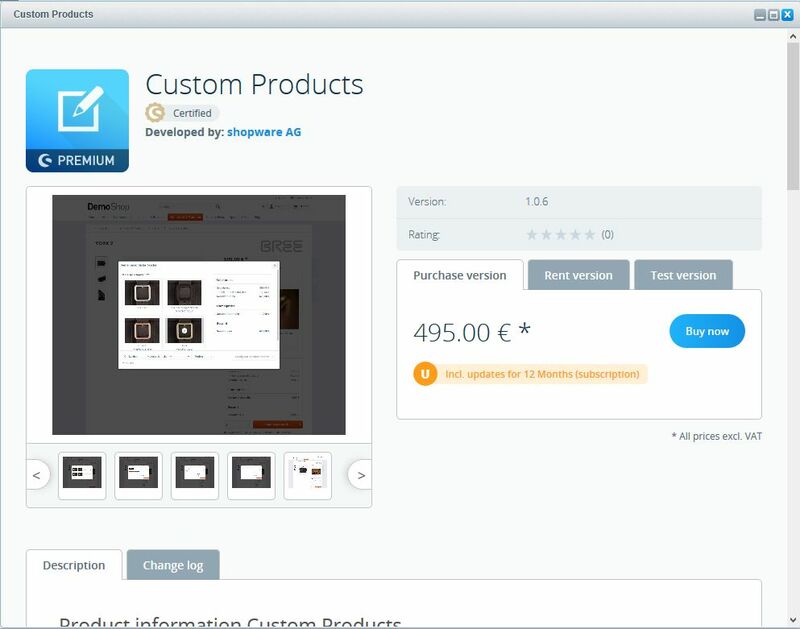 Here you can use different functions like overviewing your Showpare licenses, informations about the support of commercial versions, creating and publishing plugins to the store as well as maintaining your plugin and software subscriptions. The Shopware ID is the central identifier to log in into the Shopware websites like forum, the store or your account. Additionally you can also log in into the Plugin Manager to update plugins or buy new ones. 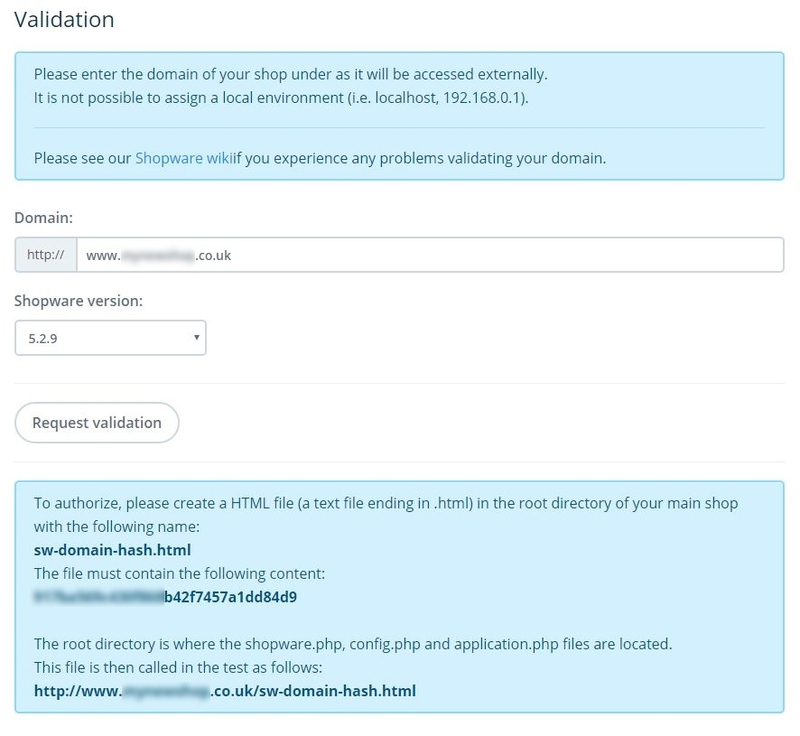 The following steps we describe how to create a Shopware ID, link your shop with your account and buy the first plugin. 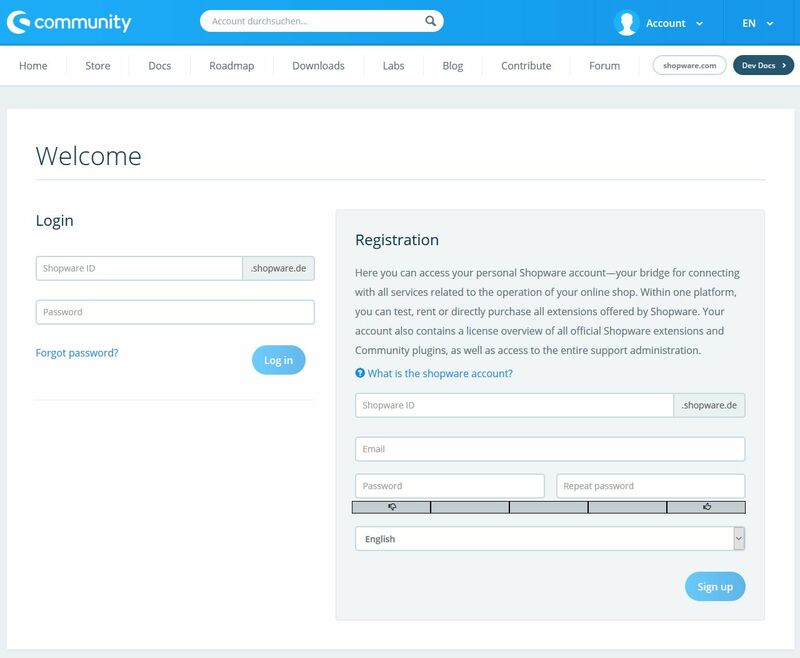 To create a Shopware account, open Shopware Account and fill the required fields on the right side (Shopware ID, email address and password). The choosen Shopware ID must be available, otherwise you can't sign up for an ID. With a click on "Sign up" your Account will be created. After sign up you can immediately log in with your credentials, but you also get a confirmation mail of your registration. After you logged in the first time, it's necessary to complete your profile, so enter the required data. After setting up your account, the basic setup is done. Please provide us with your complete and correct master data including address, e-mail address and telephone number. The company name must be indicated exactly as in the commercial register or in the business registration. If you use a trade name in business transactions, this may also be indicated (e.g. instead of "Max Mustermann" then "XYZ-Products, Inh. Max Mustermann"). We ask agencies to take care that data of clients and agency may not be mixed. For companies in other EU countries, we may only issue net invoices if we have a correct VAT ID. Otherwise we are forced to issue gross invoices. If master data is incorrect, please contact our Customer Service or Financial Services. Because licensed plugins are linked to your account and your domain, you have to link your shop to your account. Click on "Shops > Shop management > Add shop"
Accept our Terms and Conditions or Trade and enter your domain and Shopware version in the desired fields. Important!Keep in mind, that registiering shops with and without www. is a difference, so please make sure, that you register the correct URL. Now create a HTML file like described in the screenshot containing the required code. Then click on "Register now"
If the registration is successful, the new domain is shown on the following site and you can choose or change the current used Shopware Version and "Save". The new registered domain is now also visible at the top of the left menu. This dropdown will choose your booking domain. The shop now is linked with your account. 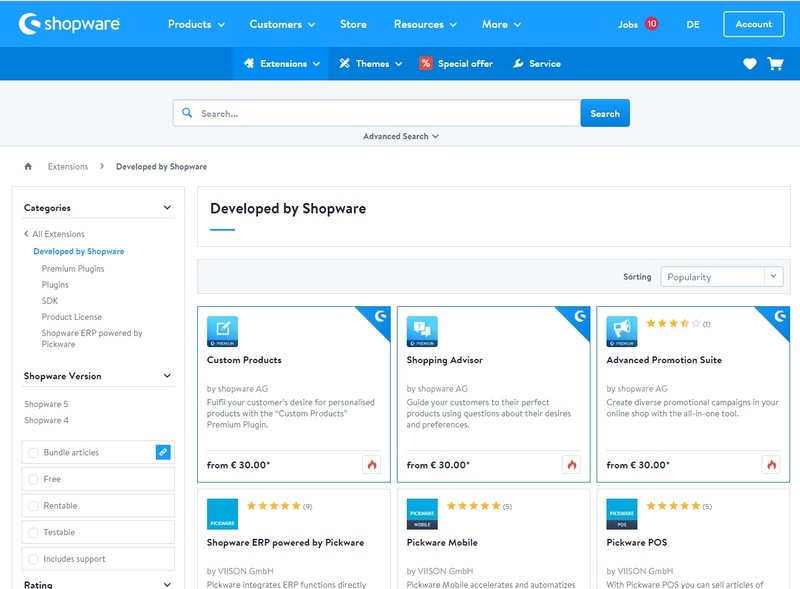 Now you can buy plugins in the Shopware Community Store or log in into the Plugin-Mananger in your Showpare backend where you can buy, manage and install your plugins. If you have registered several domains, you will find the possibility to select them in the upper left menu. Some information is only displayed for the selected domain. You can also register additional domains at any time. If you purchase plugins, themes etc. 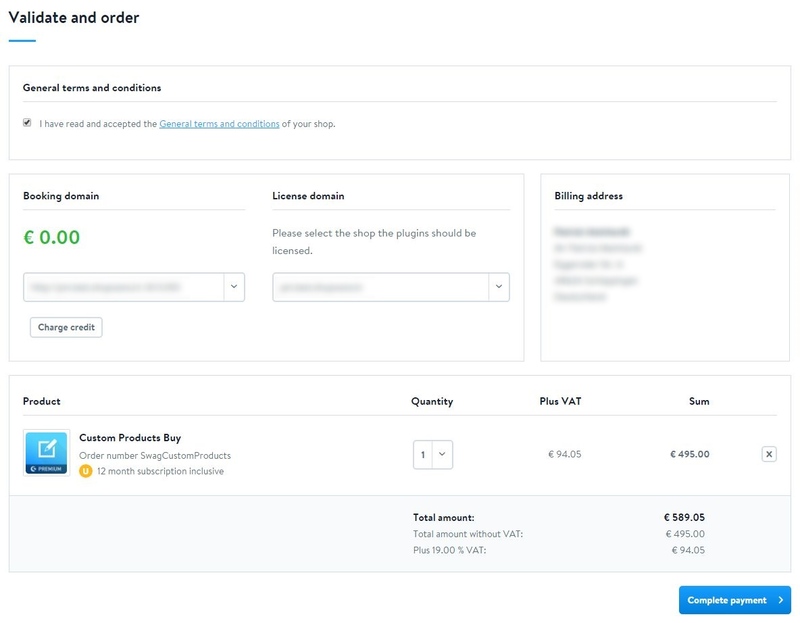 in the Shopware Store, please be aware that you can select both a booking domain (from there the money is taken) and a license domain (for this domain the license is created). To buy plugins in the community store you have to recharge your account. In your account you can make payments directly to the selected domain under "Shops > Account Charging". If you have several domains, please always check whether the correct domain has been selected. After selecting the payment type and the amount, you will be guided step by step through a dialog. You will then receive a mail for documentation. Credit card only Visacard or Mastercard, direct debit only SEPA-BASIS direct debit to euro accounts. Paypal payments in the customer account are only possible as merchant debit with debit agreement, you confirm this online in the payment window of Paypal. For bank accounts in Switzerland, please check with your bank in advance whether SEPA-BASIS direct debits are possible and supported by your bank. In addition, it is possible to conduct Paypal payments to the Paypal account "financial.services@shopware.com". Please always include your customer number and invoice number - for prepayments the customer number and domain. If you have a commercial license of our software, we usually provide you with a revolving disposition limit of EUR 1,000.00 for your account. This allows you to purchase plugin licenses throughout the month without having to pay in advance. Please note that rents and subscriptions are credited towards this disposition limit. If you do not have a disposition limit or this is exceeded, it is necessary to make an advance payment when buying and concluding new rents. You can deposit any amount of credit into your account. As a customer with a Community Edition, you do not have a disposition limit. Please recharge you account instead. We will issue a collective invoice at the end of each month. This contains all services of the month. If prepayments have already been made or there is credit in the customer account, the amount to be paid is shown accordingly lower. You will find all invoices in your account under "Profile > Invoices". Click on the blue paper clip to start the download. At this point it is also possible to settle open invoices directly with an already stored payment method. Under "Shops > Account overview" you will find all individual sales for the respective domain as well as all booking receipts of the domain for download. We cannot issue invoices for existing credit, as invoices can or may only be issued for services. To buy charged plugins it's necessary to load your account. Details you can find in Loading your account. When you are in the checkout, regard choosing the correct booking domain and also the correct license domain! Otherwise it may cause problems at booking or using the plugin in the desired shop, when it's licensed to a wrong domain. 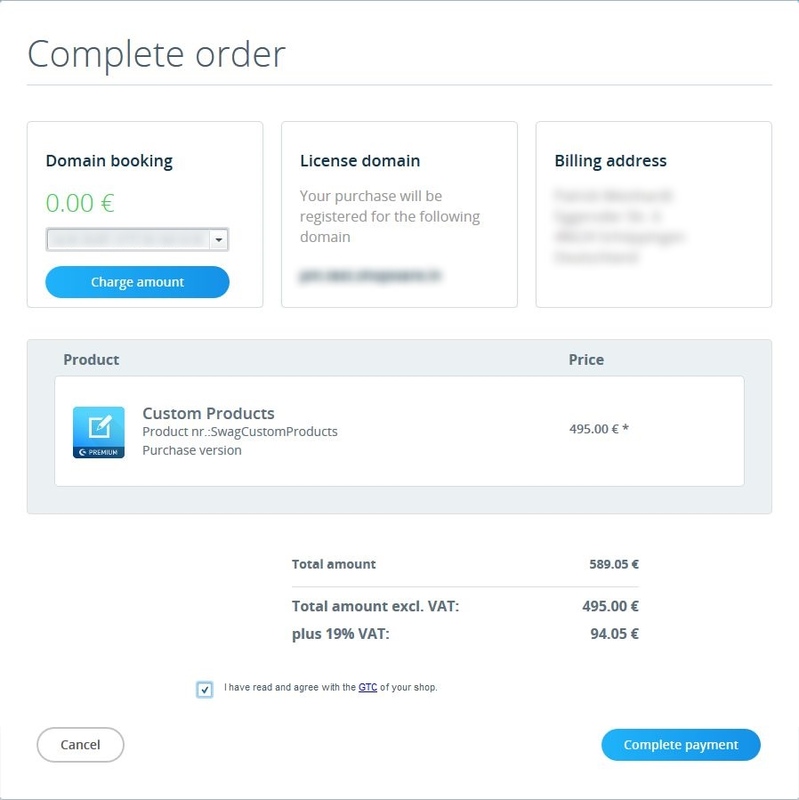 At buying over the Plugin-Mananger the license domain is automatically chosen, you only have to choose the booking domain that the purchase can be booked correctly. After successful purchase the plugin will be downloaded directly, if needed the license will also be imported and the plugin can be installed directly. The plugin then can be found in the Plugin-Mananger in "Installed". If you have any questions about our licenses & products, please contact our sales team at info@shopware.com or phone ++49 2555 9288 50. If you have any questions regarding accounting, please contact our Financial Services at financial.services@shopware.com or phone ++49 2555 9288 510. If you have technical questions about Shopware and our extensions, you can find further information in the article "Help, but where?"